The storm from Thursday has come and gone and dumped about 10 inches of snow here. My poor aching back still has not recovered. Why? Well, Thursday night JL was up sick hugging our toilet (they certainly were not friends – that’s for sure). This meant that I was the lucky winner of taking care of all 3 boys and digging us out. Tons of fun since we were not able to get the snow blower from my aunt and uncle fixed and here in time (note to self – get that DONE quickly). Here are some pictures from the last storm Thursday night as it was at the worst. These were taken when JL was coming home. His commute home is normally a 30 minute drive in BAD traffic. Well, it took much longer than that. 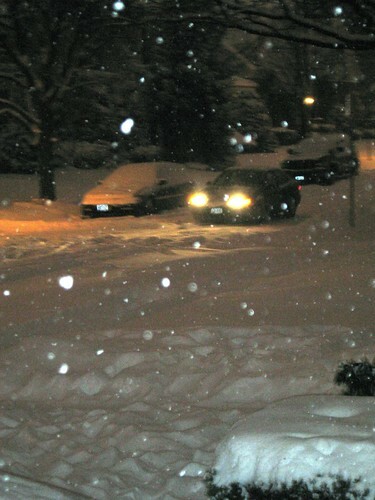 He finally arrived home about an hour and forty minutes after he put his car into drive. Even my poor mother had her fun. She typically goes 5-10 minutes to get home. It took her over 40 minutes to get out of the parking garage at work and an hour and a half total just to go partially across the city. There were NO plows out and it was miserable to say the least. This is a photo of JL coming down out street at about 6:30 Thursday evening. Not the best photo, but it gives you the idea of how "lovely" the conditions were. As you can see from this next photo it was coming down quickly and had gotten a lot deeper since I went out to shovel earlier. Friday everyone stayed home. I did not want to dig out and take NHL to school and he was really tired. So we stayed home and I dug us all the way out. 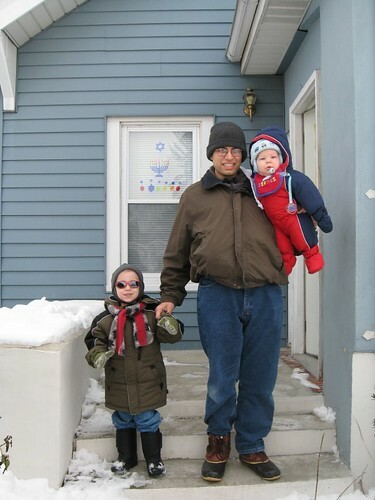 Last but not least my boys ready to brave the cold temperatures. The poor little guy didn’t know what to do. He was just happy that we were going to get him some "cushy" tissues for his poor bleeding nose. So here I sit moo-ing the little guy who is refusing solids today while the other boys are digging us out of 5-6 inches of snow while the sleet and freezing rain continues to fall. More photos to come later. I am off to see the sledding NHL and price out a move to Florida so I can be warm near Mickey Mouse!!! I hear ya on the move to FL. Let’s do it together! We can open up a combo daycare/tech support/machine shop and all be warm and happy to never use a shovel again. We had this same discussion walking around Hershey Park last night with 14 layers of clothing on and still freezing!! We got a bad ice storm that started literally 5 minutes after we were all back in the house. I have never heard an ice storm so loud. It was coming down (raining cats and dogs if you will) only the rain was ice balls! Jamie & Mark were about 45 minutes behind us (they stayed and went to chocolate world) and she had to ice skate up the sidewalk to get inside and pick her things up I took for her. 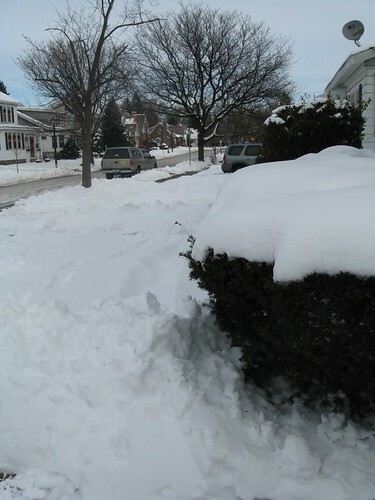 This morning B chiseled ice off both vehicles and dug out the sidewalks. Thankfully I just bought us warming ice scrapers that helped some. Hope you all fair ok in the next round. How sad is it that it is not even WINTER yet- officially! I’m sooo tired of snow. And freezing rain. And high winds. And more freezing rain. And wondering how the heck I’m getting to work tomorrow morning. Right now, Florida sounds FABULOUS! I think I’d rather complain about the humidity there than the snow here! You got a whole lot of snow! We have like nothing – just lots of cold! Sandra: I’m telling you, I am SO ready to move south. The taxes and weather here are killers! I can not wait to see some photos of you freezing your rears off at Hershey :) JL said last night one of our neighbors asked him why we still live in this weather and noted being ready to head to Florida. JL laughed and told him I had said something similar just before that. SICK that winter does not officially begin until Friday and here we have ~18 inches of snow since last Thursday thanks to two storms. Shawna: I am beyond tired of this snow, sleet, freezing rain and high winds. Poor JSL looked at me when we went into the gust today to pick up NHL. I swear the poor kid is going to have frozen snot thanks to this. 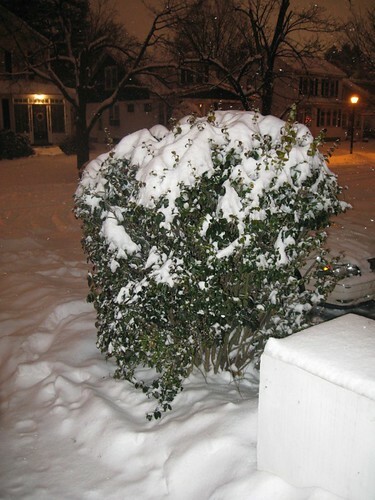 I would also gladly deal with the humidity, occasional hurricane, and funny bugs to avoid this snow every winter. 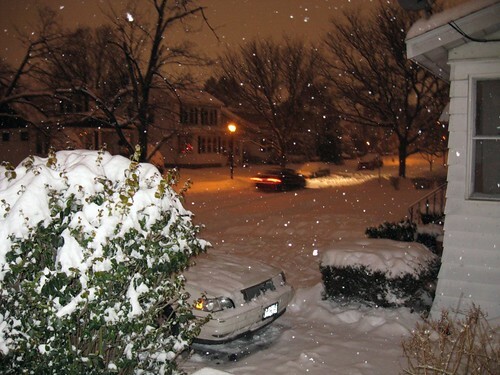 Kelly: Welcome to my blog :) Lucky you without the snow on top of the cold. This morning it was -5 with the wind chill here. Not very pleasant and lots of snow blowing all over the place.